Cream the shortening and sugar. Gradually add beaten eggs, flour, and vanilla, mixing well. Knead a few times on a floured surface until the dough is easy to work with. Roll out the dough until paper thin. (As you fold, shape, and roll the dough, the flour on your surface will get mixed in. Add flour to the rolling pin, your hands, and the dough as you work.) Cut the dough with cookie cutters into shapes; sprinkle with nuts or colored candies if desired. Place an inch apart on a lightly greased cookie sheet and bake at 350° for 10–12 minutes. If the tea cakes are small, baking may take less time. Tea cakes are ready when they are still white, with only slight browning around the edges. Take them off the cookie sheet with a spatula, and allow to cool thoroughly on a wire rack. Makes about 3 dozen crispy tea cakes. Store in an airtight container. As a child, I stood in the kitchen and watched as Mama covered the countertop with a soft white cloth. The flour and sugar she kept in drawers under the counter, and I watched her hand disappear into the drawer and emerge to sprinkle the flour onto the white cloth and roll out the sweet white cookie dough with the wooden rolling pin. Using aluminum cookie cutters with scalloped edges, she cut into thin flat rounds of dough, lifted the soft shapes, and placed them on the cookie sheet, leaving the leftover edges of dough on the white cloth. These leftover dough edges she made into a ball, then rolled out again, and cut again until the pieces left were too small for a whole cookie. Those last little pieces were mine to peel up off the flour and put into my mouth. I can still taste the soft white sweetness. I also spent a lot of time in the kitchen of my mother's older sister, Nannie Prosser, who lived across town. It was always a special day when we arrived at her house, and the kitchen was filled with that familiar smell of tea cakes. Somehow, although my grandmothers died before I was born and I didn't know where grandmothers came from, I must have associated baking and the idea of grandmothers. So one day as my aunt was making tea cakes in her kitchen, I blurted out, “How about you being my Granny?” She agreed, and from that day forward, Granny became the person, other than Mama, who made tea cakes for us. Granny was older than Mama; the tea cake recipe probably came from her. All I know is that those cookies were a symbol that all was right with the world, and, at either house, we were special and loved. Writers perform rituals. They stack books, they sharpen pencils, they arrange and rearrange their workspace to get it exactly the way they want it. When writing poetry, they move words around, lengthen and shorten lines, and grab little images that pass through their minds. Like sprinkling colored sugar and rolling and rearranging dough, they assemble and create and add the final touches. And they use their childhood memories with all the associated senses, those like touching soft, floured dough and breathing in the wonderful smell that comes with baking cookies. Handling delicate sheets of thin dough takes practice, like handling words—a reminder that we learn to cook by cooking and we learn to write by writing. “Can I write a poem instead?”. . . I stalled him. “Look, what about one of those other writings? How about an interview with one of the characters in the story?” Was he trying to duck the assignment? He hadn't done much so far with his writing. “Naw,” he said, “I got an idea, but it's a poem. I don't feel like doing none of that other stuff.” So much for planning. But he did look as if he was interested. “Do it,” I said. He smiled and went back to his seat in the back of the room. Poetry comes naturally to children. Many of the activities in this book can be done in the form of poetry, but I have a few favorite poetry activities that I will include here. Please don't save poetry and other fun writing activities until Fridays or to the end to a course or year. As Lucy Calkins (1994) writes in The Art of Teaching Writing, “‘Poetry,’ Eudora Welty has said, ‘is the school I went to in order to learn to write prose.’ Poetry can also be the school our children go to in order to write prose” (p. 370). Sprinkle poetry liberally throughout your writing program and consider how it helps students learn to use language, to write imagery, to practice form, and to express their feelings through writing. The imitation poem is a great way to let children see the beauty of the language of poetry and the way words flow together to make sounds and images. Give students a copy of a poem written by a famous poet, and read the poem aloud. Point out to them the way the poem is composed of sentences, and show them how to find the parts of speech, including the nouns, verbs, and adjectives. Ask students to imitate the poem, word-by-word, line-by-line. Where there is a noun, they will put a noun; where there is a verb, they should write a verb; where there is an adjective, they write an adjective. Margaret Walker's “Memory” (1989) is a good poem for introducing this activity. I also love to use the poetry of William Carlos Williams. Figure 6.1 is student Jack Peckham's imitation poem of Williams's “The Red Wheelbarrow” (1951). I formed the habit long ago of putting new poems into a desk drawer and letting them lie there to ripen (or the opposite) like apples. Another poem by William Carlos Williams, “This is Just to Say” (1951, p. 354), is wonderful for inspiring students to write about something they have to say that they're sorry for, but they aren't really sorry for. See Figure 6.2 for a student's imitation poem using “This is Just to Say” as a base. Source: Published in the 1985 Rain Dance Review by Baldwin High School. Used with permission. And what great writers actually pass on is not so much their words, but they hand on their breath at their moments of inspiration. If you read a great poem aloud—for example, ‘To a Skylark’ by Percy Bysshe Shelley—and read it the way he set it up and punctuated it, what you are doing is breathing his inspired breath at the moment he wrote that poem. That breath was so powerful it still can be awakened in us over 150 years later. Taking it on is very exhilarating. This is why it is good to remember: if you want to get high, don't drink whiskey; read Shakespeare, Tennyson, Keats, Neruda, Hopkins, Millay, Whitman, aloud and let your body sing. This activity is wonderful for helping students to appreciate the sound of poetry. Ask the media specialist to fill a rolling cart with anthologies of poetry, enough for each student to have a book. Students then prepare to give readings of their favorite poems from the podium in front of the room. Students practice by reading aloud to one another, and they learn that reading poetry isn't like reading prose; to read poetry, they need to make eye contact, stand on both feet, and read very, very slowly with meaning—the way practicing poets give readings, pausing at all the poignant moments. Students who need lots of personal attention especially enjoy this activity. The students quickly learn to love poetry, and reading poems aloud improves their writing and reading as well as their confidence. Poetry readings are a wonderful way for us to help our students appreciate the beauty of language. Wherever possible, enable your students to attend poetry readings. You can invite neighborhood poets into the classroom, and you can arrange field trips for younger students or bribe older students to attend local poetry events by trading a vocabulary test or some other task for their attendance. After all, what are a few new vocabulary words, some of which they probably already know anyway, when compared with a chance to appreciate the beauty of words in poetry? A teacher at a workshop once told me that she and her daughter often play a game of putting unlikes together and making up poetry and stories about them. When walking through the woods, for example, one of them will say, “an old soda can and a tree stump.” The other will begin, “The old man sat his soda down on the stump and looked up into the sky.” To build on this idea, create a box of odd things (a shoe, pencil sharpener, chalk, baseball), and a box of ideas or qualities (honesty, courage, beauty, truth, love) written on little slips of paper. Have students draw one item and one idea or quality from each box and make up a poem. Writing an imagination poem encourages students to be very creative. The object is to write a poem about what is inside a cloud or a tree trunk or what is under the ground or above the sky. Suggest that students go to such a place in their imagination and write a poem from that place. There are three steps to writing poetry from honesty and memories. The first two will get the ideas flowing. Have students think of a childhood memory that is connected with strong feelings and do a free write about the predominant feeling (anger, sadness, happiness, guilt, fear). Tell students to think about how the feeling looked on them. To help the students get started, share some of your own childhood feelings. Have students talk about these memories and these feelings in classroom circles. Then have students choose one line from their freewriting that can be a first line for a poem. Have them write this line at the top of a page, and see where it goes from there. Figures 6.3 through 6.5 show several student samples. Poetry is powerful because of the ways it can enrich people's lived lives. Poems can be read aloud at Thanksgiving dinner or at a baby's baptism. Poems can be put onto greeting cards or framed and given as gifts. Poems can also be woven into the life of a classroom community—posted next to the aquarium, chanted as a ritualized opening to every day's math class, hung on the classroom door as a motto for the community. For special occasions, have students write poems to give as gifts. They can buy an inexpensive frame and type their poems in a pretty font and decorate them on the computer. What present could mean more on Mother's Day? A 9th grader wrote the poem in Figure 6.6 (p. 130) for her mother on Valentine's Day. Help students see the poetry in their everyday lives. They can write poetry about breakfast cereal, sneakers, the girl who sits in front of them in class, the school lunchroom, or a pencil. See Figure 6.7 (p. 131) for a wonderful sample. Sprinkle pleasant writing activities throughout the school year. Some may be very brief, just five minutes at the beginning of class. Others may stretch through several days, or class periods, using the writing process to create finished pieces. Many years ago, when I was teaching one of my first English courses, I came across Ask Your Mama, a collection of poems by Langston Hughes. In one, the recurring image, ‘in a leaf of collard, green,’ came back to haunt me. I, too, have been marked by the large, purplish-tinged leaves that are, along with okra and watermelon, the African Americans' culinary mark of Cain. Collard greens have followed me all of my life and remain something I don't want to live without. They have punctuated my life perfuming each phase with their pungent aroma. This is a great activity for the last day before winter vacation or the end of the school year. Give each student an orange, and tell the students to write a detailed description of their oranges. They should notice color, shape, and size as related to the others in the room, as well as smoothness of the peel and any special markings. Next, collect all the oranges and line them up on a table. Students then come to the front one at a time, identify their own orange, and read their descriptions. Then students get to eat their oranges. You probably won't believe it until you try it, but this works with anything made in nature. I have done this activity successfully with peanuts and 30 teachers as well as with apples, plums, walnuts, and rocks. Alternatively, lemons are great for this activity. After all of the descriptions are read, students peel the lemons and discover that, inside, all the lemons look alike (just like people). David, an elementary teacher, gave his students popped popcorn. He was amazed at the creative descriptions his students wrote, describing their popcorn pieces as a crab or a rabbit with three ears. As students write these descriptions, they tend to become attached to the object they are describing. Try capitalizing on these feelings of ownership by having students name the orange (peanut, rock, or whatever), tell its hobbies, and explain, “If this [piece of popcorn] were a [teacher, student, parent], what kind would it be?” A sample popcorn biography appears in Figure 6.8 (p. 132). Read aloud to students Langston Hughes's “Thank You, Ma'am” (1996), a story in which a young boy tries to steal from an elderly woman and is, instead, taught a lesson. Ask students to write a story about an older friend or relative who has been nice to them or who is special to them for some reason. Or, ask them to write about a time they took something that wasn't theirs. Ask your students to imagine that one day each one of them will be a parent. With that thought in mind, each student should write a letter to that future child. In writing this letter, the author should tell the child about his hopes and fears. In addition, students should address some of the choices this child will have and offer some advice, such as how can the child stay on the right track in life? What can the child expect from the student as a parent? Have each student write a letter to himself. The letter is to be saved and opened when the student is 80 years old—or any age older than now. Include aspirations and dreams—what does the student hope to accomplish by 80 years old? For a different, more immediate twist on this assignment, ask each student to write a letter on the first day of school, with the understanding that the letters will be saved and read at the end of the semester or year. Have students write letters to a person with magical powers and ask that person to change something in the students' lives or to add something to their lives that will make a difference to them. Have them include in the letter how the change will affect their lives. Divide the class into groups with four or five students. Give each group a sheet of paper with one sentence on it. Each student, in turn, must write the next sentence on the paper to help form a story. When the last student receives the paper, it is returned to the first student. That student has a second chance to add a sentence to the story and to see how the story has progressed. After everyone has finished, the students can polish their story together by adding or deleting sentences. After they are satisfied with their story, they can select a leader from the group to read the story aloud to the class. The following sentences can help get this assignment started: (1) There were muddy footprints around the outside of the school. (2) Jessica knew she was in trouble, and she knew that she must do something soon. (3) The small, torn piece of paper said to meet them at the secret hideout after school. (4) The office aide told Alex to report to the principal's office immediately. Divide the class into groups of about four students each. Have each group agree on a place in town, and then write directions from the school to that place (without naming the destination). The directions should be so thorough that someone unfamiliar with the area could find the place. Then have groups exchange papers and try to identify the place by following the directions in their minds. Having students work in groups to formulate these directions promotes interaction and is an activity that often helps students see that what they write isn't always exactly what they thought or meant to write (e.g., they may leave out a key street). Instead of directions to a location, the groups could write directions for performing a task or making something, such as programming a VCR, oiling a lawn mower, servicing a car, or baking a cake. Our family spends many hours working together—planting and harvesting and running the farm stand where we sell peaches, okra, crowder peas, and all the other wonderful produce we grow. Often when we're working we find ourselves talking about the past, and what we seem to remember most is the food. You are standing outside the home you lived in as a child. Look at the outside of the house. Look at the material it is made of. Step up to the window. Look inside. You see people in there. Look closely to see what they are doing. Now, describe what you see. A student's response is in Figure 6.9 (p. 135). The professional writer may write for himself, but he does not write to himself. The writer does not exist without a reader. The purpose of writing is not to arrange ink on paper, to provide a mirror for the author's thoughts, but to carry ideas and information from the mind of one person into the mind of another. One of my mother's pet peeves was receiving thank-you notes that didn't say anything, such as “Thank you for the gift. I'm sure it will come in handy.” She felt that writing thank-you notes was becoming a lost art. Mama would put a lot of thought and work into finding a gift that she thought the recipient would want, and would be peeved when the thank-you note didn't even mention the gift. There are many good reasons to add thank-you notes to school writing programs. Students need to know how to write personal, honest, specific notes with a real audience. In the real world of school, they will be expected to write thank-you notes for graduation gifts as well as for letters of reference written by teachers. Thank-you notes are good writing activities because they are brief and are an excellent showcase for what students have learned about good writing. Their thank-you notes should be personal, honest, in their real voice, and specific to the gift itself. Many published writers say they use newspapers to spark ideas for writing. Students can also use newspaper headlines as inspiration. From newspaper articles we find characters, funny plots, and the many absurdities of the human condition. Suggest that students make up the story that could go behind the headline. Many published writers describe writing as fun and involving play. When teaching students, we also must have ideas that are creative and that allow choice and enough time to give room for play and experimentation with words and ideas. In addition, when students study the writing of published writers, they can see the play written between the lines. Unfortunately, not all writing in school seems like play. 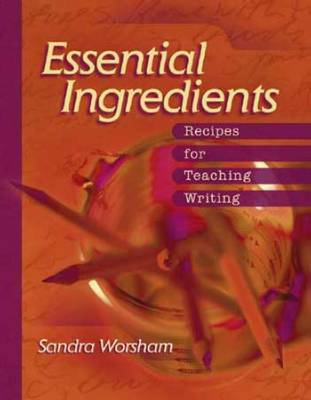 The ideas in Chapter 7 can help students learn to do the kind of writing they need to succeed in school-writing situations—while learning how to approach writing like professional writers. And, as you will see, even school writing can be creative and fun. Craft your own imitation poems to share with students. Collect funny newspaper headlines to use for writing ideas and ask students to be on the lookout, too. Create a story that takes place in your childhood room, your neighborhood, or a secret place. Share your story with your students. Copyright © 2001 by Sandra Worsham. All rights reserved. No part of this publication—including the drawings, graphs, illustrations, or chapters, except for brief quotations in critical reviews or articles—may be reproduced or transmitted in any form or by any means, electronic or mechanical, including photocopy, recording, or any information storage and retrieval system, without permission from ASCD.